I recently had the honor of moderating an amazing webinar along with Jeff Birk, Manager of Speaking and Training for O.C. 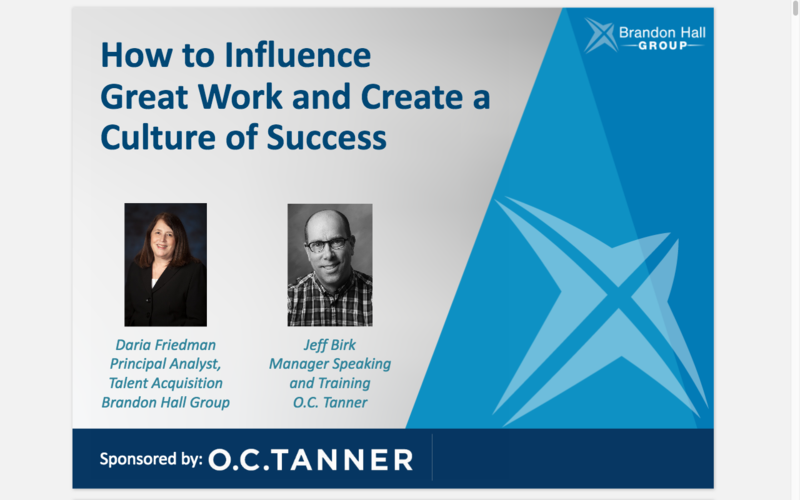 Tanner, on the topic of “How to Influence Great Work and Create a Culture of Success.” This webinar was terrific because: 1) the real-life recognition and reward stories and counsel from O.C. Tanner; 2) the lively Q & A at the end of the presentation; and 3) the more than 500 people who registered for the webinar! Of course, I highlighted some of Brandon Hall Group’s recent research findings. By the way, it really gladdens my heart to see so many people interested in this topic. I thought I would give you a summary of some of those questions and answers from the webinar because they reflect what is on the minds of many leaders. Q: Does anyone find that their organization’s rewards and recognition programs have gone stale? The big mistake, according to Jeff, is that everyone assumes their employees will like the way they are being recognized. And, that is definitely not the case. In one instance, described to our audience, after being recognized among coworkers the employee told the manager to never to do that again! That employee did not want to be singled out, even for praise. The simple solution to this problem is to survey employees to find out about their favorite interests and activities, and – most importantly – how they prefer to be recognized, such as on a one-to-one basis or among peers. To everyone’s delight, Jeff offered O.C. Tanner’s employee survey template to attendees. 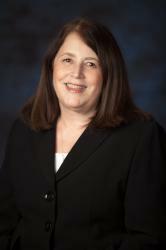 Q: I am in charge of six locations; how can my organization engage remote employees? Regardless of whether the employees are in one location, in multiple locations, or across oceans – it is essential to reward and recognize them so that they all feel part of the organization and part of the recognition moment. Taking the time and effort to include all remote employees on a phone call for the purpose of appreciating, recognizing, and rewarding employees will strengthen everyone’s engagement with the organization. O.C. Tanner does that with their worldwide employees on a frequent basis. In addition to phone calls, rewards and recognition technology can really make remote workers an integral and active part of the organization. Rewards and recognition technology can reflect the organization’s brand and facilitate recognition and appreciation anywhere. Remote workers become active participants in recognizing other employees and in receiving recognition. Q: Should meaningful recognition come from the top? According to Jeff – and I agree — meaningful recognition should come from all directions – horizontally, vertically, and sideways. One example is a call center. Sometimes the manager is not aware of everything that is going on and is not able to recognize people who deserve it. Having a rewards and recognition program enables peers to recognize each other. This benefits the overall call center culture and helps improve performance and engagement. Of course, there was much more discussed. 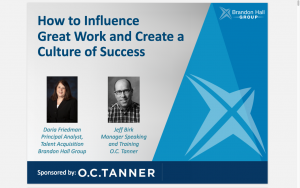 You, too, can listen to our webinar and see the research statistics that create the business case for a rewards and recognition program and learn how to influence great work and a culture of success. Next:Employee Engagement Is Not Enough!